Healthcare systems are one of the major pillars of any society. There is no great future of a nation without its citizens being healthy. Moreover, awareness related to advancement in the healthcare systems have evolved proportionately in the last few decades. Thus, creating a platform that could serve as a means to showcase your medical services at one-stop would be a great idea. We have listed various Medical WordPress themes that could give your hospitals, clinics & health care machinery a 360° outlook change and will highlight all the useful data, updates, insights and infographics of your business. The following list covers a wide variety of Medicare Themes for WordPress spanning over origins like Pediatrics, Dentistry, Dermatology, Ophthalmology & Podiatry. Due to steadfast alterations in medical systems, our listed themes enable you to offer your customers a vivid glance at even the iota information that they would search for. You can choose among them as per your suitability and help your customers get the best healthcare advice. Also, you can check out our collection of the best WordPress themes for doctors and WordPress themes for physiotherapist. 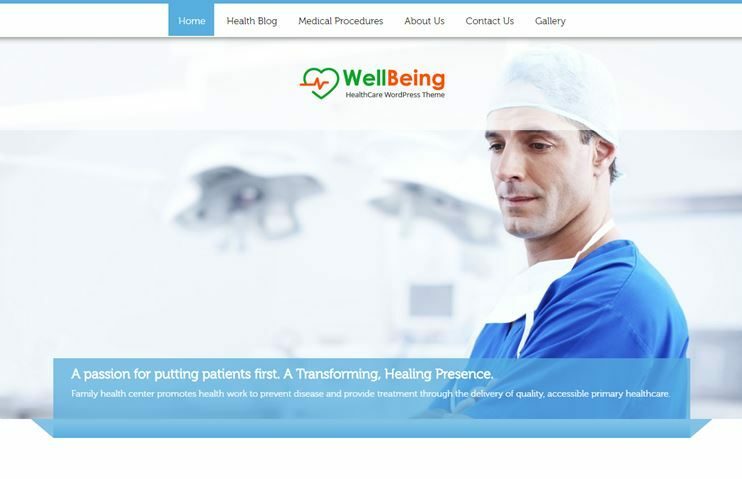 WellBeing is an engaging, clean-cut & responsive template allowing you to create a website for your medicative & iatric services. Crammed with various functional elements, the theme portrays the level of trust, compassion, and care you provide. It is integrated with a comprehensive appointment booking form which helps your clients to make an appointment anytime, anywhere. And from the back end panel, you can very easily manage all the medical utilities, bookings & the staff. Make use of the columnar & list based feature sections to illustrate medical services in the most obvious manner. Employ the various full-width & default page templates to describe the health procedures you adopt & ministrations you cater. Also, check out these best WordPress themes for Surgeon. Deliver a blow-by-blow roundup of your eye specialist clinic & services via the well-bred template. 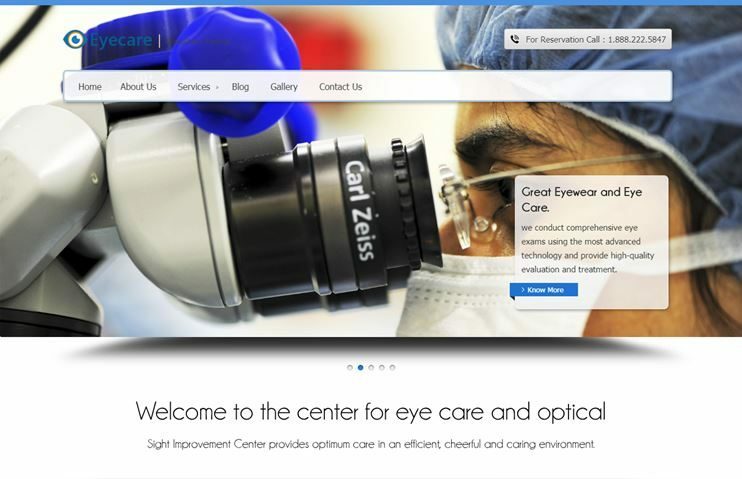 Uphold the eye diagnostic & treatment services with content rich sliders, feature sections & many other site elements. 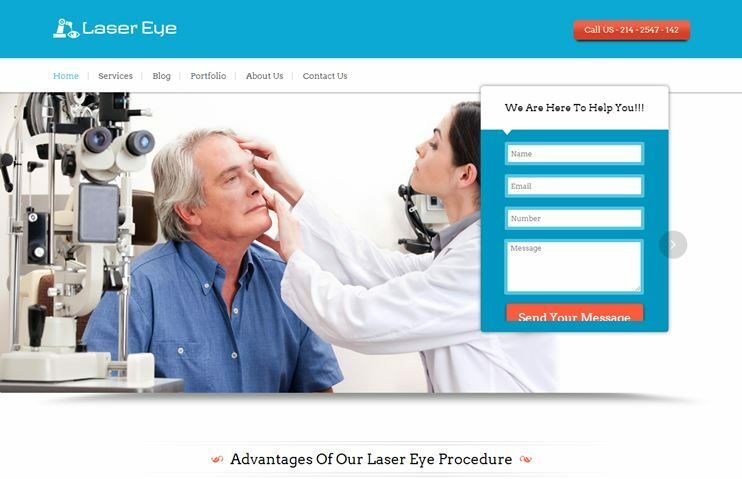 Pluck the heed of clients through videos, business tagline & the call to action button can be used to guide them to any custom page of the eyecare website. You can easily change color scheme of the website to best suit your & your customer’s aesthetic vision. Display contact details of your opto-care clinic right on the header & make it easy for the needy ones to contact you. 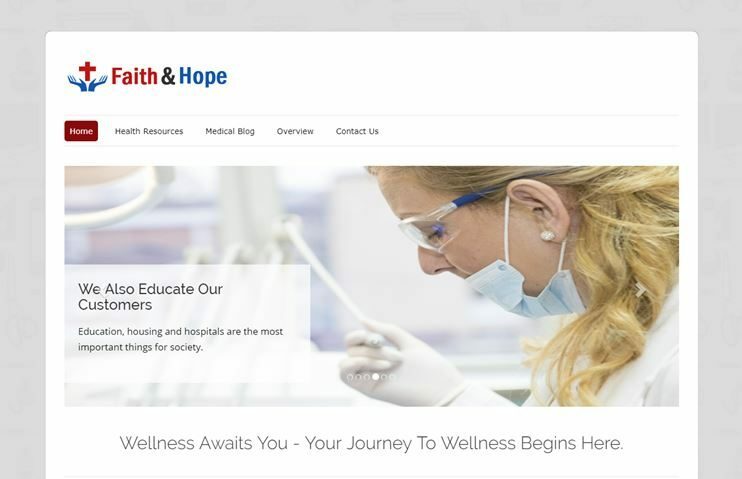 ‘Faith & Hope’ is a feature loaded WordPress Theme crafted keeping in mind simplicity & functionality. The responsive template is encapsulated with appointment booking form, which flashes on the inbuilt page layouts. Using this form your clients can book their meeting & from the admin panel you can schedule their appointments according to your priorities. Apprise the medical theories, inventions & other health related news through blogs, videos & feature segments. With a great navigation menu, contact form & well structured information one can nimbly find anything & everything needed. Dermatologist WordPress Theme has a plethora of attributes that utterly helps to promote the skin care clinic amidst a widespread crowd. Implanted with a powerful appointment booking form, the patients on the frontend can schedule their meeting in just one click & from the back end you can execute & disburse all the services. The animated site elements like slider images, layered blog post section, client testimonials not just depict the dermato-pathology services, but also annotate them specifically. 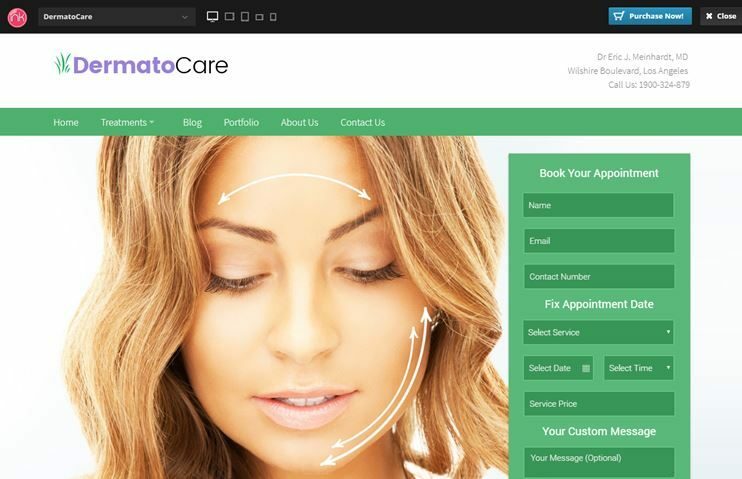 PS: Also check these best WordPress theme for dermatologists from Templatic. With a clean & modern look, the PodiaCare template presents all the foot orthotics services before the clients in an explicate manner. The sticky contact details on header, office address, timings & google map on the homepage sidebar helps your patients to locate & contact you in no time. Splash the chiropodist supports that you dole out on the dropdown menu, exhibit pictures on the gallery portfolio page & grow your network through the social site icons on the footer. 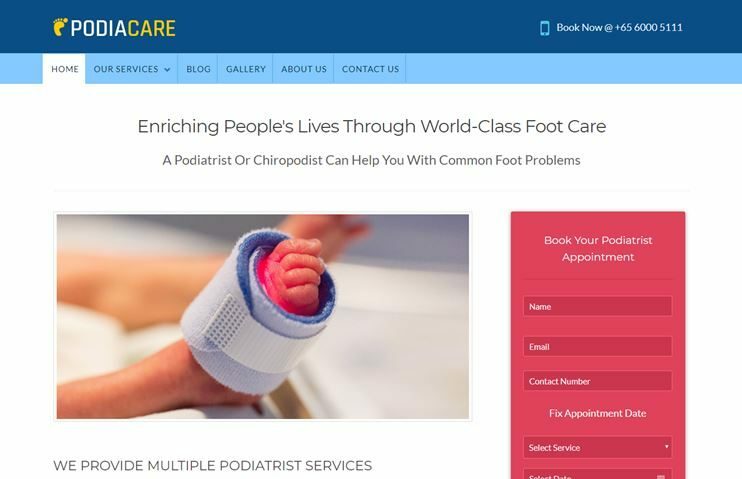 The Pediatrician WordPress Template is a long lasting solution for baby health instructors & they can acquaint the child care facilities straight forth on the homepage. The full-screen sliders with text & call to action button are the perfect mode to fetch the cognizance of patrons. The theme offers two types of feature area: column & accordion section, which can be utilized to conduct the child health & diagnostic services. Share videos, client feedbacks & medical profile on homepage & on the footer area. 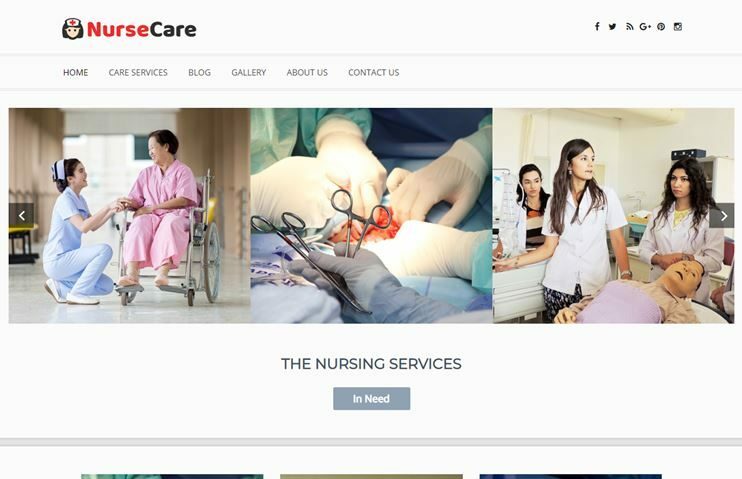 Private Nursing is a uniquely designed Template having a multi-column full-width slider which has a hovering effect. These segments are a sure shot heed catcher of the website & they can be used to drive the clients to any desired page of your nursing service site. Flourish your service motto in the business tagline area, feature section & flaunt multiple client testimonials on the homepage. Upload your custom logo on the site to personalize it & share social site icons to leverage more network. Elaborate the laser eye treatment clinic amidst a wide customer orbit using the professional & to-the-point layout. The theme’s responsiveness enables the patients to browse the website from any device & the lead capture form on the homepage helps them to contact you without a dig on the site. The powerful form facilitates you to expand your customer base by collecting the contact information of the users & regularly feeding them with the news of your eye clinic. The recent blogs, videos & feature section can be used to provide a deeper insight of the optometry centre. Faceted on a lone background the Family Dentistry theme is the onliest framework crafted for personal dental clinics & oral health centers. The drop-down menu & different full-width, default page layouts can be used to elucidate the preventive care units & treatments you provide. The template is embedded with a radical Appointment Booking System which allows your customer to book an appointment 24/7 via any device. You can even start collecting online payments using the secure PayPal payment module. 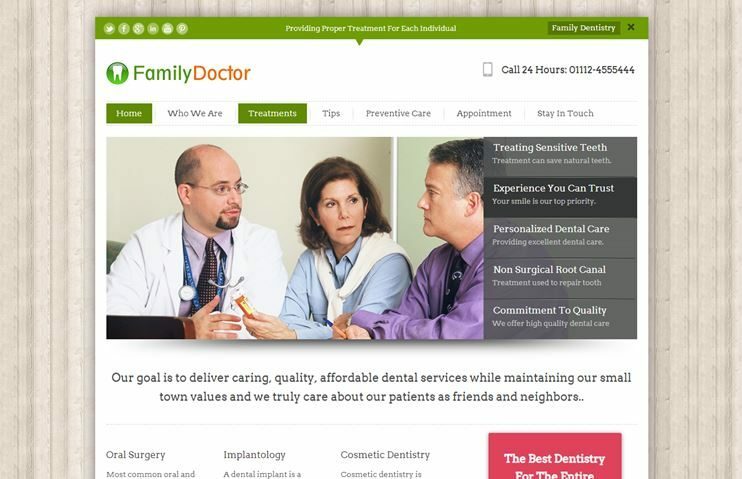 Also, check our best WordPress theme for dental clinic for more options. 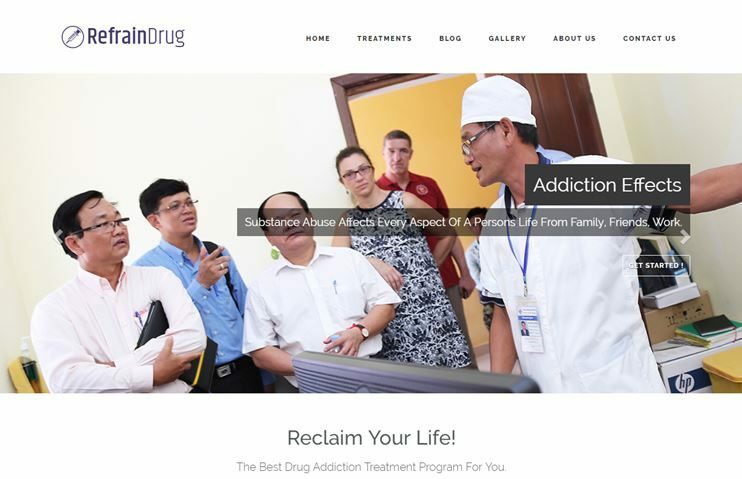 The Refrain Drug Template offers boxed as well as full-width homepage layout to change the semblance of your drug rehab center's website. The variant site elements are ingrained with animation effect & they blaze a very interactive online platform. The lead capture form, videos, parallax image area & content rich slider images are a superb groove to promote the medical services. The blog post section of homepage & the feature areas provide an easy browsing feat to the prospects. You can easily change the outlook of the site by changing the color scheme & typography from the admin panel. Listed above are some of the best WordPress medical themes that you can use to create your medical websites. 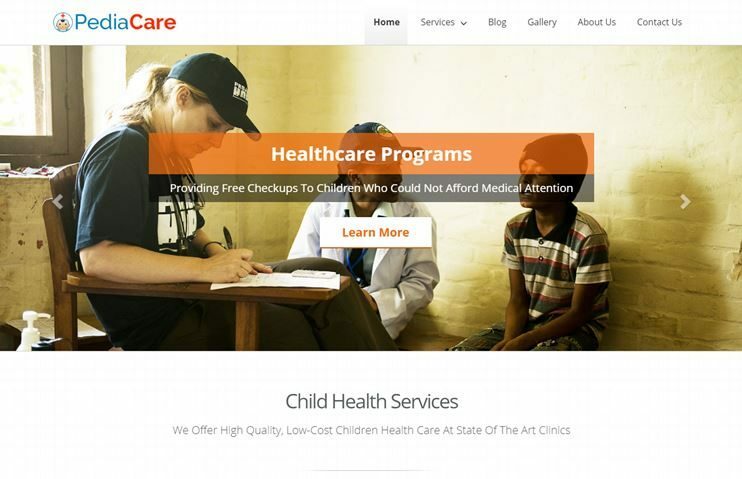 All of these themes are designed to help you create your medical websites without writing a line of code. When you go for a more generalized and all-purpose medical theme, you have customize it to make it suit your medical specialization. So here we present you the themes that are all designed for a specific medical branch, crafted to fit their purpose. So grab and theme and start creating your website on your own. WooCommerce bookings review – How good it is to create WordPress booking systems? Thanks for the list, we will use some of the themes for our clients’ websites!